NASA’s James Webb Space Telescope and Chandra X-ray observatory have something in common: a huge test chamber used to simulate the hazards of space and the distant glow of starlight. Viewers can learn about this mysterious chamber and its history in “X-Factor,” a new video in the “Behind the Webb” series. The video takes viewers behind the scenes to understand more about the Webb telescope and how it compares with other NASA observatories. The “X-Factor” episode is timed to coincide with the Chandra 15 year anniversary, as the satellite was launched on July 23, 1999. Mary Estacion of the Space Telescope Science Institute (STScI) in Baltimore, Md. hosts the series. Estacion interviewed Dr. Martin C. Weisskopf, project scientist for NASA’s Chandra X-ray observatory and Chief Scientist for X-ray Astronomy in the Space Sciences Department at NASA’s Marshall Space Flight Center in Huntsville, Alabama. Dr. Weisskopf explains how the Webb, Hubble and Chandra observatories look at different parts of the electromagnetic spectrum (light at various different energies). The Chandra observatory collects x-rays, very energetic particles of light. The Hubble Space Telescope operates in a different part of the spectrum looking at visible light and the upcoming James Webb Space Telescope will operate in near and mid-infrared light. The vacuum chamber, located at the X-ray and Cryogenic Test Facility or XRCF at NASA Marshall is the “X-factor” that ties the Webb telescope and Chandra together. 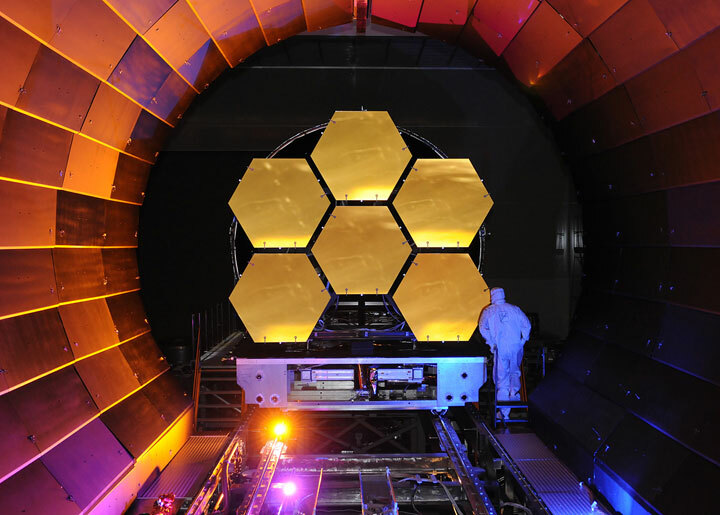 The Chandra X-Ray Observatory was tested there in the 1990s and the chamber was used to test the Webb telescope’s mirrors from 2008 to 2011. One of the mysteries of the testing chamber is a long tube that is connected to the building that houses it. The tube spans the length of almost six football fields. Weisskopf explained the long tube was used to separate the X-ray source from the Chandra telescope by a long distance, simulating distant sources like stars. Testing the Webb telescope demands a similar beam of light, but uses a more compact optical design to simulate a distant star. The tube remains connected for any future mission that may look at the X-ray emission from astronomical objects. Webb is an international project led by NASA with its partners the European Space Agency and the Canadian Space Agency. The 3 minute and 7 second video was produced at STScI. The “Behind the Webb” video series is available in HQ, large and small Quicktime formats, HD, Large and Small WMV formats, and HD, Large and Small Xvid formats.